Are Freedom Foods Shares (ASX FNP) A Stock To Buy? | MF & Co.
Are Freedom Foods Shares (ASX FNP) A Stock To Buy? 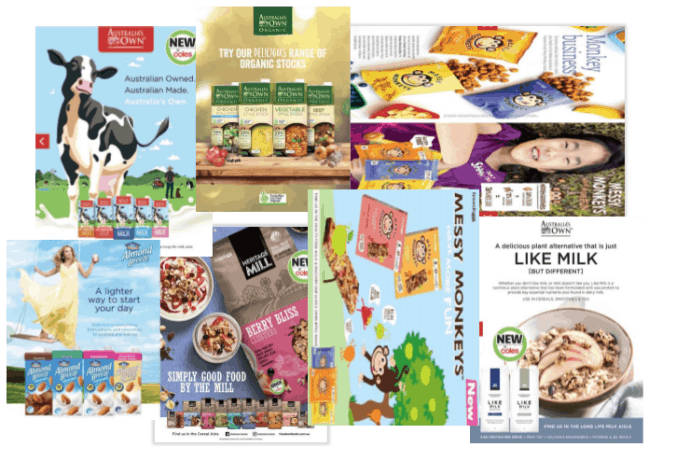 Freedom Foods Group Ltd (ASX FNP) sources, manufactures, sells and distributes specialty cereal and snacks, plant and dairy-based beverages and nutritional products. 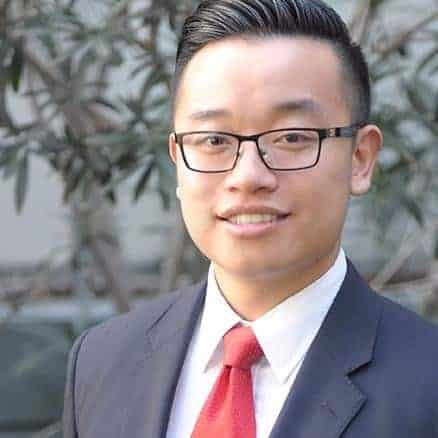 Freedom Foods shares has a footprint in China, South East Asia FNP’s health-focused cereals and snacks are sales leaders on e-commerce site Tmall and JD.com, the two most significant online e-commerce websites in China. Freedom Foods have also entered North America since 2015. In FY18, FNP launched over 70 new products. Net sales increased 34.5% to A$353M, operating EBITDA increased 49.3% to A$39.2M and operating net profit increased by 96.9% to A$19.4M. FNP currently sits at about A$1.63B market capitalization. Are Freedom Food shares better than its competitors? 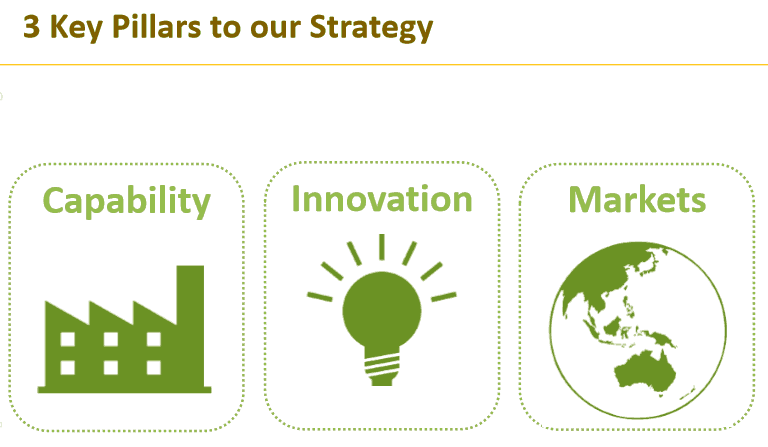 The key strategy of FNP is described as three ‘pillars’: capability, innovation, and markets. 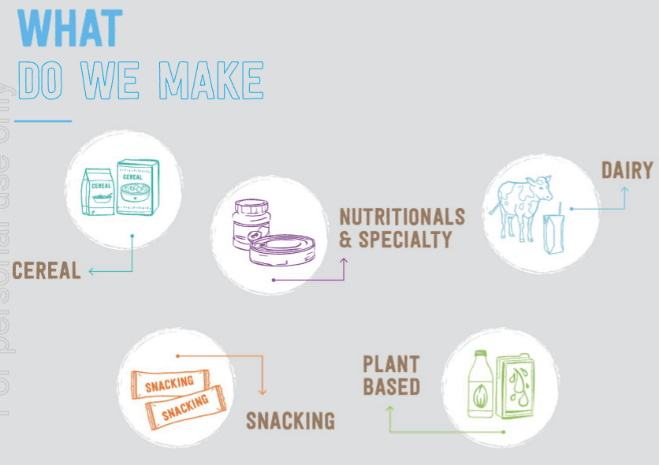 Its diversified portfolio of products, which includes cereal, nutritional & specialty (Vital Health), dairy, snacking and plant-based beverages, and numerous innovative product formats under each category, makes it difficult to identify the one key product or strategy of FNP. However, it is believed that FNP does not have a key product. Its three key strategies corresponding to each ‘pillar’ are to realize growth through higher capacity in dairy, innovative product formats and overall higher brand awareness. Rapidly increased dairy capacity ahead of expected demand. FNP has completed A$350M CAPEX over three years including a new state of the art UHT dairy and milk processing facility in Ingleburn in South West Sydney. Furthermore, FNP revised its dairy production projection aggressively by almost doubling its FY20 plan, from 180 million litres to 350 litres. 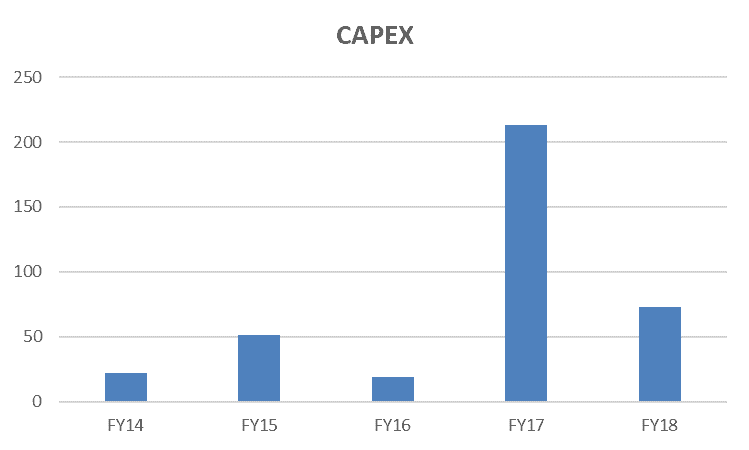 High CAPEX is expected to increase FNP’s capacity, efficiency, and profitability further. Increase Market Share Through Innovation. FNP attempts to increase its market share and brand awareness in Australia by updating its products frequently. 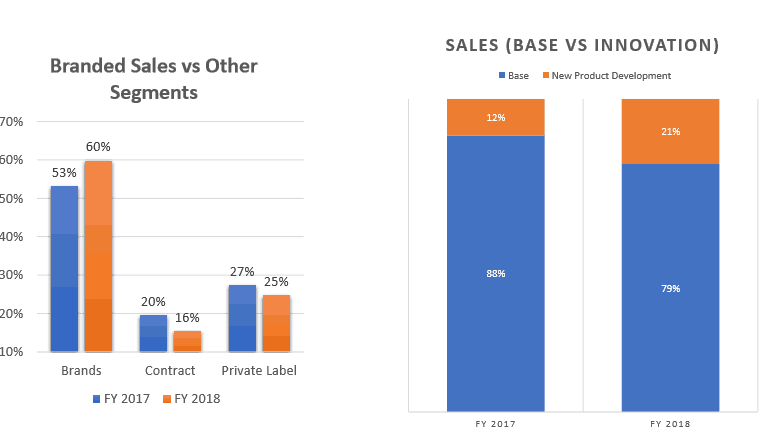 In FY18 another 70 kinds of products were launched, and FNP has seen an increase in branded sales from 53% to 60% and innovative products taking up 21%, up from 12% of total sales (as illustrated below). In total FNP has 37 brands and more than a hundred products, while cereals & snacking has the highest number of brands at 16(See graph below). Consequently, it ranked first within the health food section of retail supermarkets in Australia, No.1 in UHT Plant Beverages in Australia and it even won 2018 World food innovation awards. 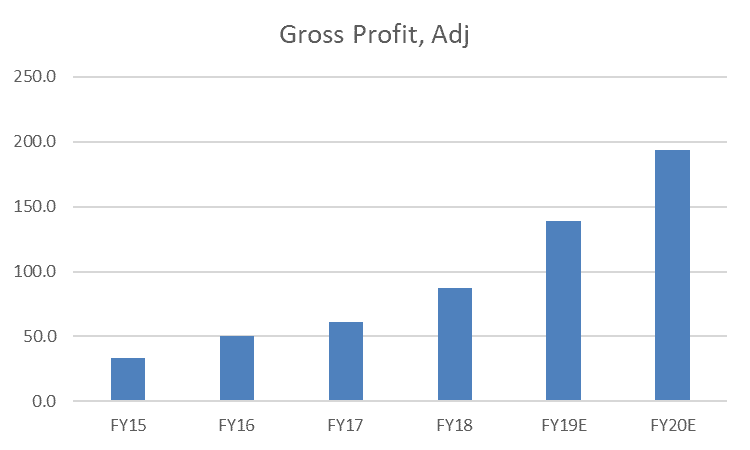 FNP recorded a very positive trend in revenue and gross profit. But EBITDA and net income saw declining trend FY17-18, primarily due to its expansion in the market. High Revenue Growth in core segments. All segments but seafood have seen high revenue growth FY13-17. Seafood has declined from $A18M to A$13.8M while cereal & snacks tripled from $30M to A$90M and plant beverages increased six-fold from $10M to $64M FY13-17. 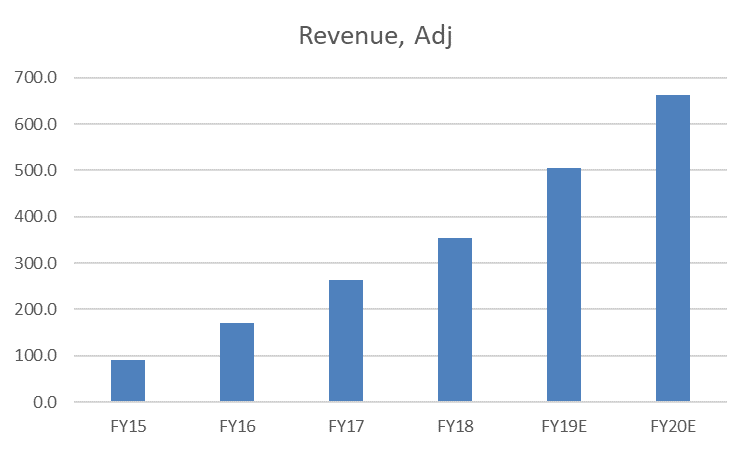 The dairy segment, since PDG was acquired in FY15, has seen the highest growth in revenue and has the highest contribution (35.5%) to total revenue in FY18. Revenue contribution of each segment in FY18 is dairy (35.5%), cereal & snacks (34.1%), plant beverages (24.4%) and seafood (5.3%). Declining Margin due to Expansive Product Portfolio and Reshaped retail landscape. An expansive product portfolio that consists of 37 brands and more than a hundred products have lowered FNP’s margin. 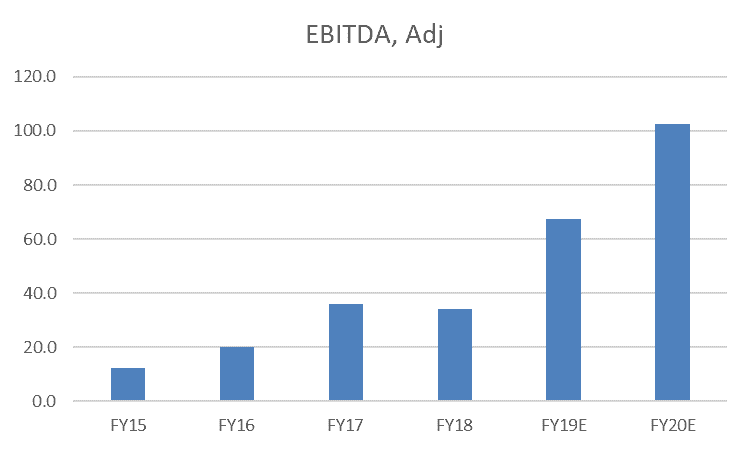 Plant beverage category of FNP (operated under Pactum Australia) has the fastest expansion of product lines and saw EBITDA margin FY17-18 down from 30.9% to 13.7%. On the contrary, dairy segment (PDG) has a more concentrated product portfolio and saw about 100% increase in EBITDA, from 5.7% to 11.5%. Moreover, the increased competitiveness in the supermarket industry could be blamed for Freedom Foods shares low margin. According to FY18 IBIS World report, the rise of Aldi has forced retail giants like Woolworths and Coles to reduce prices to remain competitive. The competitiveness of the retail industry may have a flow-on effect on FNP’s profitability, as its sales in Australia is mostly channelled through Woolworths and Coles. 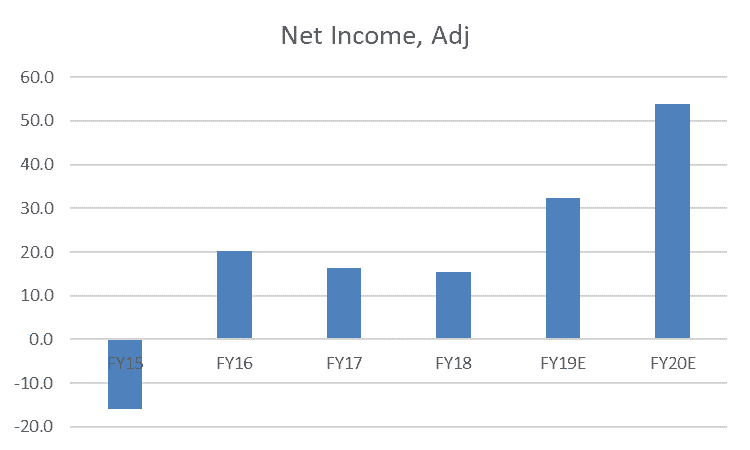 Overall, the overall EBITDA declined from 17% in FY14 to 8.6% in FY18, and normalized net income margin fell from 11.8% to 4.4% FY16-18. Freedom Foods shares (ASX FNP), Costa Group shares (ASX CGC), Bega Cheese shares (ASX BGA), and Graincorp shares (ASX GNC) all belong to the GICS industry group of Food, Beverage and Tobacco. Costa Group produces, packs, and markets fruits and vegetables. Bega Cheese operates in two segments including cheese and Tatura milk. GrainCorp receives and stores grain and related commodities. Underperforming EBITDA Margin. 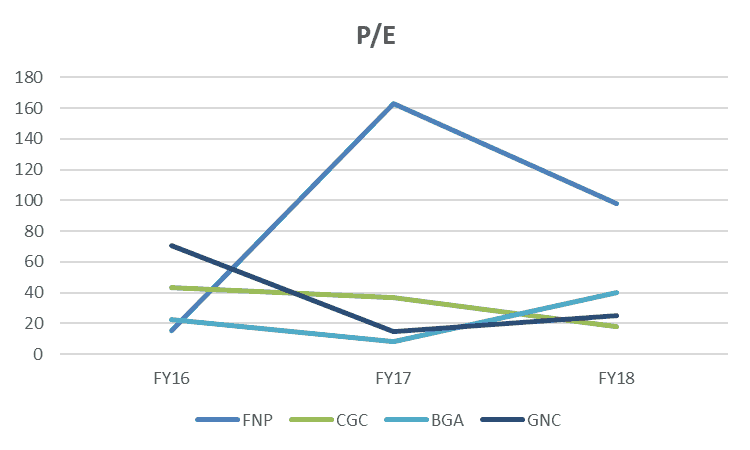 Compared to its competitors, FNP’s EBITDA lost the advantage it had to BGA and GNC by declining from 17% to 8.6% FY14-18. In contrast, CGC surpassed FNP in FY17 and reached 18.8% in FY18. Underperforming Profit Margin. Freedom Foods shares profit margin fell from 9% to 2.8% FY15-17 and bounced back to 3.6% in FY18. CGC again led the league in profit margin, which increased from 0.63% to 7.65% FY15-18. However, FNP’s underperformance of margin is most likely due to its rapid expansion, and it is expected to reduce costs and improve margin soon. Improved but Still High P/E. Freedom foods shares P/E ratio dropped 48.5% from 163 to 84 FY17-18. 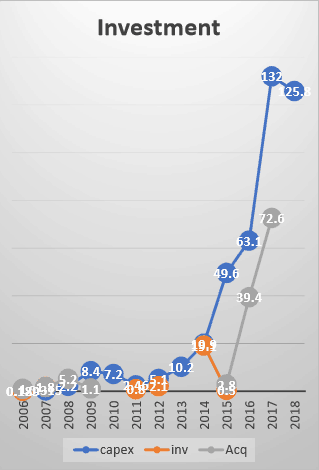 Still, it is much higher than its competitors who sits around 20-40. However, this could also reflects the market’s confidence in its potential growth. Export to China is expected to increase steadily due to online channels and demand growth. By partnering with robust e-commerce platforms of JD.com and Tmall, FNP’s UHT and cereals export to China is expected to see high growth. FNP tactfully chose online retail because e-commerce in China is proliferating, with online transactions increased 300% from US$1.23 trillion to US$3.97 trillion in five years. 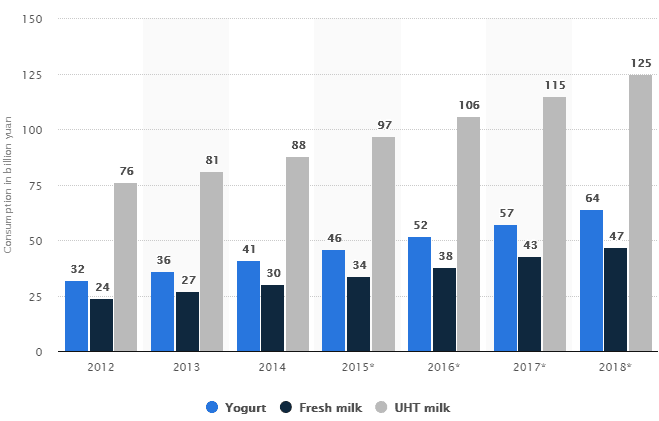 Furthermore, UHT milk consumption takes up 50% of Chinese dairy sales, and it is growing steadily throughout the last five years (as illustrated). However, FNP’s products are not competitive in price due to tariffs. M&F Co conducted a proprietary investigation on customer feedback on JD.com and Tmall (the two biggest channels that FNP used in China). The results show that although most of the Chinese customers like FNP’s products, they commented that it was ‘too expensive’. This higher price comes from import tax and transport cost, which has made FNP’s products about 300% more expensive in China than in Australia. Such a high price tag has impeded most Chinese customers from buying FNP’s products. Furthermore, as the trade war between China and the US escalates, it is uncertain whether the tax rate could further increase. Worse still, there are many strong competitors on China’s e-commerce platform, including Devondale, Arla and Weidendorf, who sell almost identical UHT products at a similar price. Nevertheless, the overall prospect of Chinese export is positive. As FNP further increase its capacity, a reduction in price is possible. Additionally, UHT demand from China is strong. Moreover, UHT sales in China are relatively inelastic to price as Chinese consumers are willing to pay a premium for foreign brands due to the 2008 milk scandal. UHT has a low market share in Australia. Over half of the consumption of milk in Australia comes from full cream and UHT takes up less than 10%. However, the lower market share may present opportunities for UHT milk as UHT has a lower price tag to fresh milk, especially during economic uncertainty. 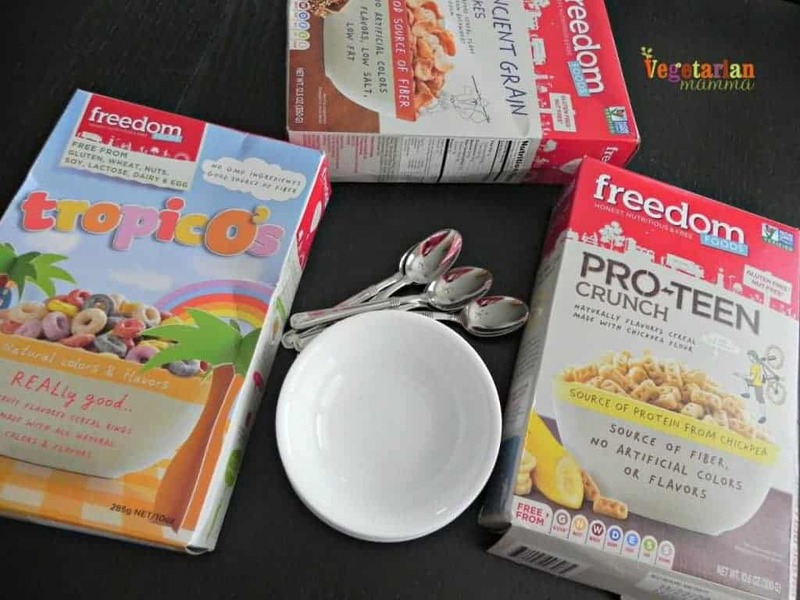 Freedom Foods Group Ltd (FNP) is a fast-growing company that sells specialty cereal and snacks, plant and dairy-based beverages and nutritional products with an international footprint. Its three strategies of higher capacity, innovative product format, and brand awareness have contributed to its exponential growth in the last three years. Investment in dairy equipment is expected to improve FNP’s capacity, and China’s UHT market offers steady growth opportunities. However, UHT takes up a small share of the Australian market and FNP sees lower margin, primarily due to its aggressive expansion of product portfolio. Moreover, compared to most of its competitors, FNP is no longer as attractive as it was regarding financial ratios such as margins and PE. Nevertheless, FNP is playing the long game by organically growing its brands, and there is substantial upward potential in the long term should its ‘three-pillar’ strategy work out.